We had our seventy-sixth Tamale Hut Café Writers Group meeting on Saturday, January 12. Thanks to Kathy, Sean, Vickie, Brian, John, Matt H, Marianne, Salvador, and Lisa for joining me for a snowy afternoon of conversation and critique. Thanks, too, to Jaime for pledging another year of support for our Saturday afternoon get-togethers. – The Windy City Pulp and Paper Convention (http://windycitypulpandpaper.com/home/) will be on April 12-14 this year, which happens to be the second Saturday of April. I asked if the group wanted to have the meeting without me or if we should reschedule, and reschedule got the unanimous vote. The April meeting will be on April 6. – Those Were The Days (http://www.nostalgiadigest.com/those%20were%20the%20days.htm) on Jan 12 ran the radio version of Casablanca from 1943, starring Humphrey Bogart, Ingrid Bergman and Paul Henreid recreating the characters they played in the film. On the 19th TWTD will play the 1944 radio version, starring Alan Ladd, Hedy Lamarr and John Loder. You usually can stream the last two episodes od the program from the site, so the 1943 version will be available for approximately another week as of this writing, and the show containing the 1944 version should be posted by Tuesday and remain up for two weeks. – I received e-mail from five people interested in joining our group. I think the snow kept some away this month, but we did get a visit from Jennifer from a new Writers Group at the North Riverside Library (http://www.northriversidelibrary.org/events/writers-group/). She said that they were looking to move their monthly meetings away from the second Saturday, which would avoid conflicts with our group and allow writers to attend both if they wish. She said she would let me know their new schedule and I’ll share with the group when she does. – Sean picked up a copy of On Writing by George V. Higgins, and likes how the author uses actual examples from published novels when making his points. He’s also picked up complete works anthologies by F. Scott Fitzgerald and Oscar Wilde, and is reading Get Shorty by Elmore Leonard. He also purchased and e-book collection of Nick Fury comics with art by Jim Steranko. – Brian is in the middle of Conundrum by Jan Morris, an author whom he’s spoken highly of at past meetings. – Marianne hasn’t been reading for pleasure, but she’s been reading a lot for research for a project she’s working on. – Salvador was finally able to finish The House of Broken Angels by Luís Alberto Urrea. He said that despite the section in the middle where the story wandered off on a tangent he thought distracted from the rest of the book, overall he liked it. “It is effectively classified as a poem. The original author was Guillermo Aguirre y Fierro, born in San Luis Potosi, Mexico, in 1887. Only three names are presented: Raul, Juan and Arturo. The other bohemians in the group are nameless. Thanks for the follow-up, Salvador. – around January 27, I will to send a reminder to you to submit a piece for critique during our next meeting. – our next THC Writers Group meeting will be Saturday, February 9 at 2PM at the Tamale Hut Café. – The next Tamale Hut Café Reading Series event will be Saturday, February 23 at 7PM. Please check the blog (http://thcreadingseries.wordpress.com/) for more information. Happy New Year, everyone! I hope you had a great holiday season, regardless of the holidays your family celebrates, and I hope you got some writing done during that time. If not, I hope you at least got some inspiration for stories to tell in the new year. Few things bring out the storyteller in you like hanging out for a while with your crazy relatives! The next THC Writers Group meeting will be Saturday, January 12th, at the Tamale Hut Café, starting at 2PM. If you can attend, we’d love to see you there. If you would like to submit a piece for critique during the meeting,please send it to thcwritersgroup@gmail.com, along with an idea of the level of feedback you are looking for, and I will distribute it to the group. If you have something you would like feedback on but you can’t attend the meeting, I’d be glad to forward it to the group as well. We can discuss it at the meeting and get some comments back to you via e-mail. I hope to see you all on the 12th for the Writing Group, and on the 19th for the first Reading Series night of 2019. We had our seventy-fifth Tamale Hut Café Writers Group meeting on Saturday, December 8. Thanks to Gary D, Steve, Salvador, Sean, Beth, Marianne, Cary, and new member John for joining me for a very bright sunny afternoon of conversation and critique. Thanks, too, to Matt H for mailing in comments, and to Jaime for the south-facing windows that had many attendees donning sunglasses as the afternoon sun shone in. – Our next two meetings will be on Jan 12 and Feb 9. I’m waiting for the Reading Series dates before creating the flyers, because I like to include the dates on the bottom. They should be up next weekend. – Another NaNoWriMo is over, and we had two winners in our group: Cary wrote 50,084 words in November, and Matt B wrote 50,505. Aaron wasn’t at the meeting to share his results, but even if he didn’t hit the 50K word goal, from his page on the NaNoWriMo site it appears as though he got a significant amount of writing done in the month, which makes him a winner as well. Congratulations, all! – Steve has been preparing for his annual part in Handel’s Messiah, and was walking around with a book of the sheet music to prove it. – Salvador thought he was going to have to give back the borrowed copy The House of Broken Angels by Luís Alberto Urrea he’s been reading, but he’s just found out that he has a reprieve and may actually get to finish it! He says it started strong but is getting bogged down in the middle. The rest of the meeting was taken up with the usual varied discussions about general writing topics. The topic of research for our stories came up again, when one critique pointed out some factual inaccuracies in one of the pieces. One of the major issues was identified by another writer who has admittedly very specific knowledge of the technology in question, so much of the conversation revolved around whether the author should feel the need to change the story, considering the small audience that would notice. We should certainly strive to be as accurate as possible with the technical details of the story (as I try with the aviation bits in my story) but we are writing fiction, so maybe there can be a little creative license taken. We might also take into account how much our expected audience might know. Certainly, no one else at the table noticed the inaccuracy in an otherwise enjoyable and compelling story. – around December 30, I will to send a reminder to you to submit a piece for critique during our next meeting. – our next THC Writers Group meeting will be Saturday, January 12 at 2PM at the Tamale Hut Café. – The next Tamale Hut Café Reading Series event will be Saturday, January 26 at 7PM. Please check the blog (http://thcreadingseries.wordpress.com/) for more information. I’ll keep this brief, because I’m in the home stretch for NaNoWriMo. I don’t know if I’ll hit my goal, but it’s looking like I’ll at least be darn close. I already know that some of what I’m writing will need some serious rewrites, but some of it is pretty good, or so Stephie tells me. The next THC Writers Group meeting will be Saturday, December 8th, at the Tamale Hut Café, starting at 2PM. If you can attend, we’d love to see you there. If you would like to submit a piece for critique during the meeting please send it to thcwritersgroup@gmail.com, along with an idea of the level of feedback you are looking for, and I will distribute it to the group. If you have something you would like feedback on but you can’t attend the meeting, I’d be glad to forward it to the group as well. We can discuss it at the meeting and get some comments back to you via e-mail. I hope to see you all on the 8th for the final Writers Group meeting before Christmas. Maybe I’ll bring egg nog. We had our seventy-fourth Tamale Hut Café Writers Group meeting on Saturday, November 10, the anniversary of the wreck of the Edmund Fitzgerald in 1975 (nothing to do with us but interesting, and was the basis for a great song.) Thanks to Steve, Sean, Lisa, Marianne, Cary, Gary D, Gary P, and Aaron for joining me for a sunny fall afternoon of conversation and critique. Thanks, too, to Matt H and Rebecca for mailing in comments, and to Jaime for the hospitality. – I reminded the group that the next Reading Series night is Nov. 17, and will feature the five winners from this year’s writers contest. Congratulations to group members Molly and Matt H, who are two of the finalists. Come on out on the 17th to support them! – Sean liked The Hellbound Heart by Clive Barker, which was the source for the Hellraiser movies. He’d not read much Barker but plans to seek more out. – Lisa is thoroughly enjoying Reservoir 13 by Jon McGregor. She says she almost never gives five star reviews, but this one deserved it. – Marianne read the harrowing Typhoid Mary by Judith Walzer Leavitt. She also read Typhoid Mary: An Urban Historical by Anthony Bourdain. She said the first was a very detailed account of the true story of a cook who infected many people before she was discovered. The Bourdain book was interesting because it was written from a cook’s perspective. The rest of the meeting was taken up with the usual varied discussions about general writing topics. One interesting distraction was a discussion about book reviews. These days, everyone wants reviews, and many service providers seem to pressure you to give them a five-star review, frequently saying that they need to get the top review every time. Lisa mentioned that the book she was reading warrants a five-star review, only the third she’s ever given in her life. I asked her what criteria she uses, and whether it depends on the venue. (For example, the movie reviews on Netflix seem to stress entertainment value rather than quality.) She said she uses a combination of both, as did most of the attendees. We’ve all read “classics” which were of undeniable quality, but with minimal entertainment value. 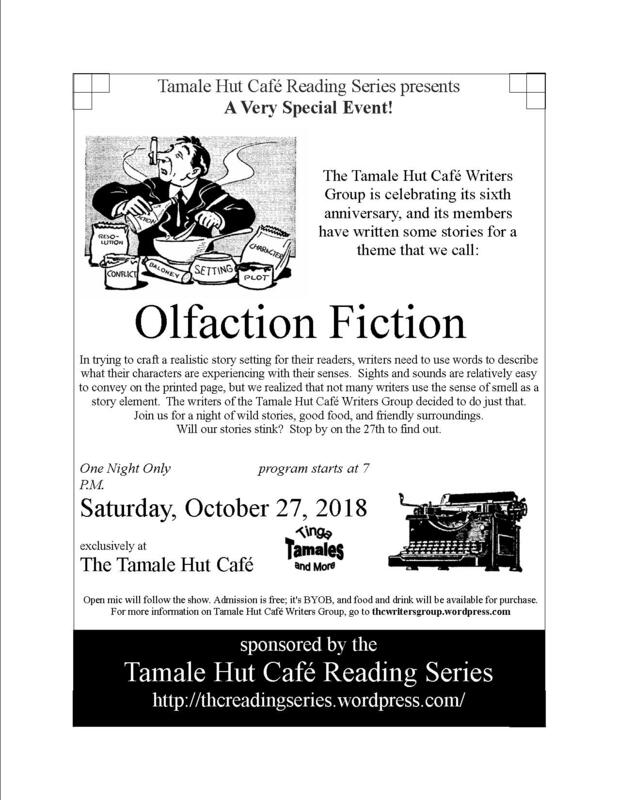 – The next Tamale Hut Café Reading Series event will be Saturday, November 17 at 7PM, when the featured readers will be the winners of this year’s THC Short Story Contest. Please check the blog (http://thcreadingseries.wordpress.com/) for more information. – around November 25, I hope to come out of my post-Thanksgiving tryptophan haze to send a reminder to you to submit a piece for critique during our next meeting. – our next THC Writers Group meeting will be Saturday, December 8 at 2PM at the Tamale Hut Café. We had an intimate evening for our feature night at the THC Reading Series last month, and we heard lots of stories with smells in them (but none of them stunk!) Now it’s back to work on our regular projects, especially for those of us who are attempting NaNoWriMo this year. The next THC Writers Group meeting will be Saturday, November 10th, at the Tamale Hut Café, starting at 2PM. If you can attend, we’d love to see you there. If you would like to submit a piece for critique during the meeting please send it to thcwritersgroup@gmail.com, along with an idea of the level of feedback you are looking for, and I will distribute it to the group. If you have something you would like feedback on but you can’t attend the meeting, I’d be glad to forward it to the group as well. We can discuss it at the meeting and get some comments back to you via e-mail. I hope to see you all on the 10th for the Writers Group, and at the next Reading Series night on November 17.